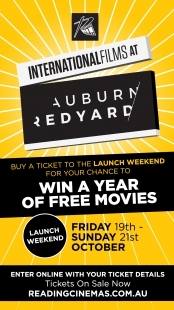 International Films are coming to Reading Cinemas Auburn and to celebrate, we’re giving our fabulous customers the chance to WIN FREE MOVIES FOR A YEAR with a Reading Cinemas' Gold Card! For your chance to win, simply purchase a ticket to any International Film at Reading Cinemas Auburn from October 19-21 and enter the competition below! Which International Film did you see at Auburn Redyard, and what did you love about the experience? **1 entry per ticket purchased - ticket serial number or E-Tix confirmation code required for entry. Remember to hold onto your ticket as proof of purchase in case you are the winner.